After a tour of duty in Iraq, the Army Ranger platoon containing Pat and Kevin Tillman, the Black Sheep—officially, 2nd Platoon, A Company, 2nd Battalion, 75th Ranger Regiment—ship out from Fort Lewis, Washington, to Afghanistan. It is to participate in a new offensive codenamed Operation Mountain Storm (OMS) (see May 23-June 1, 2002 and Early 2003). Tillman 'Battled Steadfastly' - The year before, the Tillman brothers’ platoon had been sent to Iraq (see March 2003). 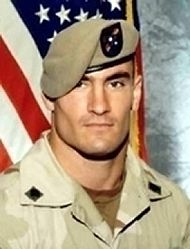 There, in place of his fallen lead gunner, Pat Tillman stepped up to his first firefight and “battled steadfastly.” Although Tillman voices opposition to the war in Iraq, he originally joined the military because he wanted to fight in Afghanistan (see Early 2004). Uthlaut "Pushes the Envelope" - Uthlaut questions the order. He messages CFT the following: “I strongly recommend not splitting the platoon… for several reasons.” Mainly, Uthlaut is concerned for the safety of the platoon. 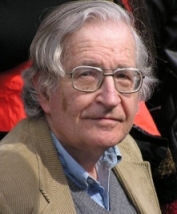 He feels its security will be undermined by the split. Part of the platoon will be without a satellite radio. In addition, half of the soldiers will be without his immediate command. He brings up these concerns and also asks if it is not a problem that one of the two “serial” convoys will have less firepower in that there is only one heavy weapon—a .50 caliber machine gun—between the entire platoon. This fact does not persuade command to alter its order. In addition, Uthlaut will testify that he is aware that standard operating procedure had changed since two Rangers were killed in ambush recently—“our clearing procedures were to clear the villages in the day time”—so as to be a less visible target. He asks if the platoon element that is to go ahead to Manah will begin a night operation. Even as he makes plans to re-configure his men into separate convoys, he is still “disagreeing with… the course of action.” His concerns about communication are met with the information that there is another satellite radio on one of the vehicles in addition to his own, as the company commander’s vehicle is being used. Then he learns that “the clearing was not to start at night.” Instead, serial one proceeding in advance of serial two is to “set up an assembly area,” outside of the village, wait for two, and clear the next morning in daylight. Ordered by command to split up into two convoys, Kevin and Pat Tillman’s platoon leaves Magarah (see April 22, 2004 and May 23-June 1, 2002) en route to clear the village of Manah near the Afghanistan-Pakistan border. Both convoys must move through a narrow canyon, presided over by steep cliffs where they are easy targets for enemy fighters. 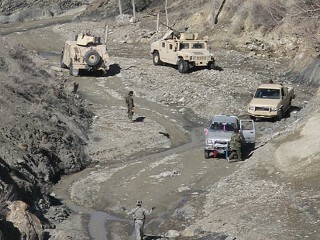 Brothers in Separate Convoys - The brothers ride in separate convoys, Pat in designated Serial One, advancing to the village; Kevin, in designated Serial Two, escorting a local tow truck with the platoon’s disabled Humvee (see April 20-22,2004). Kevin and Pat Tillman. 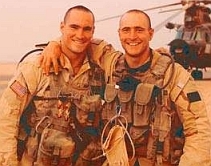 [Source: IraqHeroes (.com)]The Tillman brothers (see May 23-June 1, 2002) ride in separate convoys to complete a mission, Pat Tillman in designated Serial One and Kevin Tillman in Serial Two; while One moves safely through a dangerous canyon, Two, following shortly behind, runs into an ambush ( see April 22, 2004 and 6:14 p.m.-6:34 p.m. April 22, 2004). Half of Pat Tillman’s platoon, the Black Sheep, attempts to exit a narrow canyon-slot in southeastern Afghanistan where it has been ambushed (see 6:34 p.m. April 22, 2004). Coming out of the ambush, the part of the platoon known as Serial Two, in which Tillman’s brother Kevin rides, fires on Serial One, Pat Tillman’s convoy (see May 23-June 1, 2002 and 6:34 p.m. April 22, 2004). Serial Two Draws Fire; AMF Soldier Fires AK-47 over Road - Weeks will report seeing muzzle flashes and silhouettes and that the first convoy “received fire from across the valley as well.” Tillman runs back to his squad’s leader to ask him if he can take off his body armor and also to let him know where he is positioned. According to Army regulations, Weeks cannot allow him to drop his body armor. O’Neal will tell Army criminal investigators that while Tillman seeks orders from Weeks, the AMF soldier is “firing in all directions… firing over the main road.” Coming back to position, Tillman tells the small firing team that it will be running up a hill.